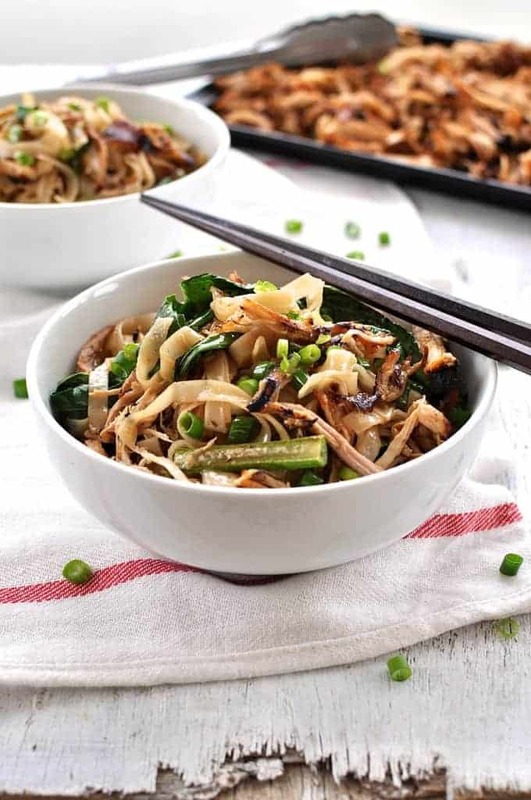 This Crispy Shredded Chicken Noodle Stir Fry takes just 10 minutes to make using both the meat and braising liquid from my Slow Cooker Crispy Chinese Shredded Chicken recipe. The shredded chicken is juicy inside and crisp on the outside which is a fabulous contrast to the slippery noodles. There is almost an entire bunch of Chinese broccoli in this stir fry, which makes this a complete meal. 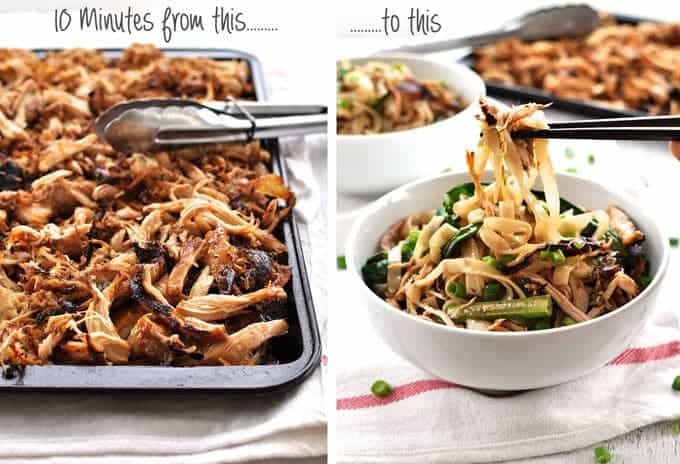 This is an example of a fast meal you can make using Slow Cooker Crispy Chinese Shredded Chicken which is great for freezing. When it comes to fast meals, this is by far my best for effort vs output. 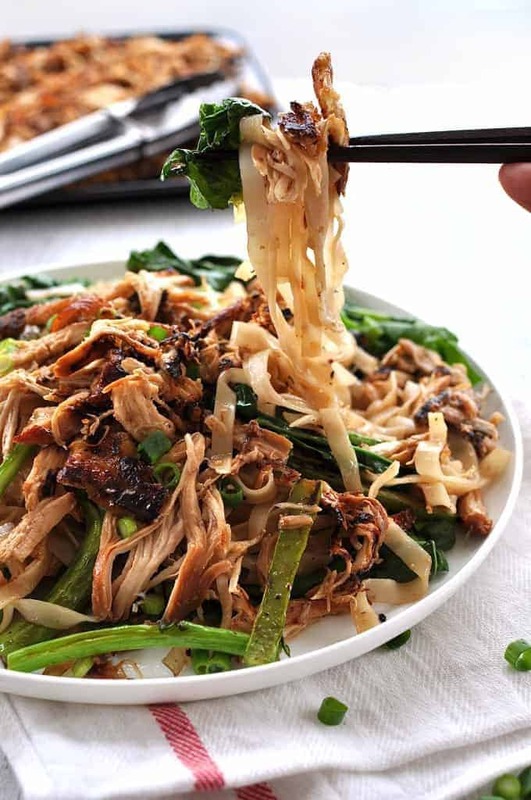 These stir fry noodles are a complete meal with almost an entire bunch of Chinese broccoli tossed throughout the noodles and it honestly takes just 10 minutes to make using leftover Slow Cooker Crispy Chinese Shredded Chicken. And it’s not just the chicken that is used, I also use the braising liquid as the stir fry sauce. The braising liquid for the Slow Cooker Crispy Chinese Shredded Chicken is made using Chinese cooking wine (or sherry), light soy sauce, vinegar, ginger, garlic and sugar which are classic Chinese flavours. It then gets the benefit of the flavour and juices of a chicken slow cooking in it for 8 hours. So the sauce has some serious flavour, flavour that is impossible to replicate using sauces and pastes from jars. It is pure gold. And it probably costs all of $1.50 for the ingredients that go into it (a large bottle of Chinese cooking wine is $0.99 at my local Asian store!). When it comes to Asian food, I can’t resist a bit of a kick so I added a generous squeeze of Sriracha sauce. 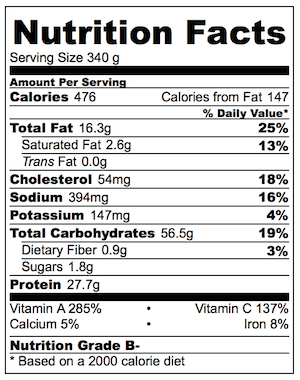 But you can leave this out if you want to, or substitute with whatever your hot sauce of choice is. Or use fresh chillies or a chilli paste. Whatever rocks your boat! One tip that makes this slightly faster to cook than other stir fries is the way I get the garlic flavour into it. Rather than mincing garlic, I crush a clove with the side of my knife, slip the skin off then stir fry it to infuse the oil with the flavour. Just for 30 seconds or so. Then discard the garlic. This serves two purposes. Firstly, it is faster than finely chopping a garlic clove or saves on washing up a garlic crusher. Secondly, you won’t get little burnt bits of garlic in your stir fry. Because stir fries need to be cooked over very high heat (screaming hot, as high as your stove will go), depending on how heavy based your wok / fry pan is, minced garlic has a tendency to burn quickly. This results in little black bitter bits of garlic all through your stir fry. It’s hard to pick what I love best about these noodles. The slippery noodles coated in the sweet, salty sauce with a hit of chili, garlic and ginger? The shreds of chicken clinging to them that are crisp on the outside and juicy on the inside? The Chinese broccoli that blends so well into the noodles that no one would guess there’s almost a whole bunch in there? Hmm. Why be forced to pick? Oh. And how could I forget the kicker? Dinner on the table in 10 minutes. I would love to hear what you think! If you have any questions at all, just leave them in the comments section below and I’ll be sure to answer them. This is a super quick stir fry made using the chicken and braising liquid from my Slow Cooker Crispy Chinese Shredded Chicken. It freezes extremely well so is fantastic to have on hand for fast midweek meals. I made this stir fry using Chinese Broccoli but you can use whatever vegetables you wish. Bean sprouts, carrots, other Chinese greens, broccoli and sliced onion would go particularly well in this dish. Cook / soak rice stick noodles according to packet instructions. Drain and set aside. Heat oil in wok or large fry pan over high heat. Add garlic and stir fry for 30 seconds to flavour the oil. Remove and discard garlic. Add the Chinese broccoli stems and Shredded Chicken and stir fry for 1 1/2 minutes. Add the noodles, braising liquid and Sriracaha (if using) and stir fry, tossing the noodles rapidly to coat with the sauce for about 1 minute. The sugar in the braising liquid should make the noodles char a bit. Add the Chinese broccoli leaves and toss to mix in with the noodles, then remove from heat. The Chinese broccoli leaves will continue to cook from the residual heat. 1. You can buy rice stick noodles at supermarkets nowadays and they are usually very cheap, the price (usually less) of pasta. They are available in the Asian section. Rice stick noodles are thick flat noodles, about the width of fettucine. Cook them according to the packet instructions. Some brands say you can just soak them in boiling water for 3 to 5 minutes. Some say boil them in water for a few minutes. Always undercook them slightly (like pasta - just cook them so they are al dente). Overcooked rice noodles are sticky and will break apart when you stir fry them. 2. Using smashed garlic cloves is a wonderful way to add garlic flavour to stir fries without the risk of having burnt bits of minced garlic throughout the stir fry. Just bang down on unpeeled cloves with the side of your knife to burst the garlic open (but still roughly stays as one piece). Then the skin will slip right off. 3. The chicken is slow cooked in a classic Chinese braising liquid. The braising liquid can be used for many things, including salad dressings, as a sauce to drizzle over the chicken, and also as a stir fry sauce which is how it is used in this recipe. 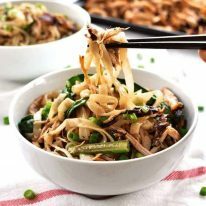 I can’t find any rice stick noodles in the supermarket (I’m in the UK) – could I use regular rice or egg noodles instead? Made this last night and it was packed with incredible flavour and so delicious. Everyone scoffed it down. I ended up using more noodles so used more of the braising liquid and I was so excited it was as yummy as it looked because I have also got a batch of the chicken and liquid in the freezer. Everyone loved this!!!!!! Brilliant use of time and ingredient, here! Our whole family (six boys and two dads) loves both noodles and chicken; I can’t wait to wow them with this recipe of yours. Thanks so much for sharing! Hi Nagi, I’ve just made your crispy chicken and my gosh is it yummy. Hi Natalie – I’m so glad you enjoyed it! The braising liquid is delicious, isn’t it? It’s so amazing that just a few ingredients can make such a delicious sauce!! Neil Perry is awesome 🙂 The liquid can be frozen for 2 to 3 months, as long as the meat itself can be. So you have plenty of time!! Hi Nagi, I’ve come back to add a thank you comment. I have made this dish time and time again and it is simply delicious. Such a quick week night meal that is full proof. So damn yummy! I love everything about this! I have such a hard time finding Chinese broccoli when the farmer’s market isn’t running. I have no idea why it isn’t more common in grocery stores because it’s the best! Have you tried this with broccoli or broccolini? Thanks Marissa!! It will definitely work with broccolini. Broccoli will be harder because the florets are bigger. If you cut them vertically in half they will stir fry ok though. Hope you give it a try! What a great dish, it looks like it took hours to make. I love noodle dishes and can’t wait to try your recipe. Thanks Janette! That’s what I love about slow cooker dishes – they always look like they took hours to prepare! Yes! That’s perfect!! I never thought to use braising liquid for a stir fry until I made this dish. I’m popping over to your blog now to check out your chicken broth recipe, I need a good staple, I usually “wing it”! I did the same way with you, how to make garlic flavor into oil for stir-frying, I’m to lazy to mincing the garlic :-). I love spicy Asian food, especially noodle with sambal made from fresh red chili (rawit). Hi Amallia – I thought you might like this one! Very similar strong spicy flavours to Indonesian food 🙂 I love the tip of crushing garlic to infuse the oil with garlic flavour. My mother taught me that! I am making this tonight and cannot wait for my families reaction…read the reviews and will soon tell you what my family thinks tonight.